FIGURE 5-22 (A) Cis-active sites in the hGH promoter. Transcription of the GH-1 gene is regulated by proteins that bind to regulatory elements in the 300 bp preceding the start of transcription (arrow). The two Pit-l-binding sites are shown together with sites for NF-1, USF, AP2, Spl, and the glucocorticoid receptor. (B) Pit-1 protein, helices, and domains. The human Pit-1 gene encodes a 291-amino-acid protein that binds to regulatory elements in the GH, PRL, and Pit-1 promoters. It consists of three recognized domains. They are an amino-terminal transcriptional activation domain, a POU-homeo-specific domain containing two «-helices, and a POU-homeodomain containing three a-helices. Reproduced with permission from Parks, J. S., Pfaffle, R. W., Brown, M. R., Abdul-Latif, H„ and Meacham, L. R. (1995). Growth hormone deficiency. In "Molecular Endocrinology" (B. D. Weintraub, ed. ), pp. 473-490. Raven Press, NY. inhibiting hormone or somatostatin; CNS, central nervous system; 5-HT, 5-hydroxytryptamine or serotonin; /3-end, /3-endorphin. Solid lines ending in arrows indicate direct actions; beaded lines ending in arrows to feedback effects and encircled sign (+ or -) indicates whether the feedback effect is positive or negative. The same signs are used for direct actions to indicate positive or negative effects. 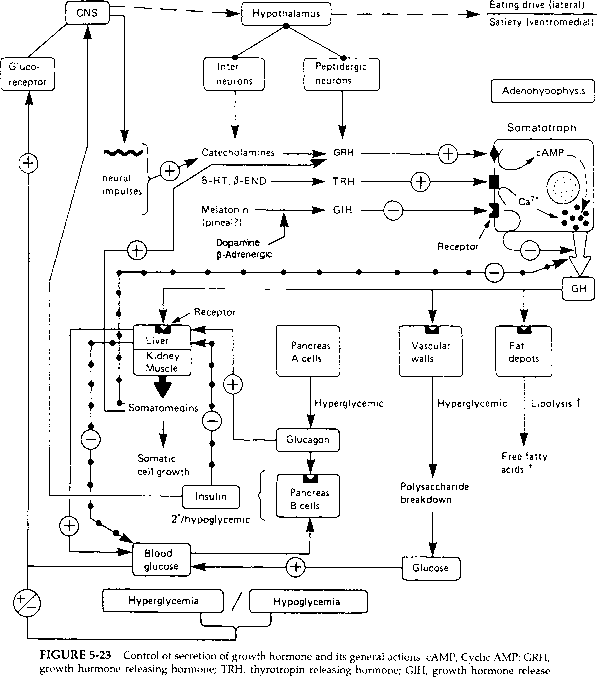 Dashed lines refer to hypothetical stimulatory pathways. A computer model of the GH-binding protein in serum, based on crystallographic coordinates, which is derived from the GH receptor, is shown bound with GH in Figure 5-24. In this model hot spots for mutations are indicated by naming the participant amino acid residues. It appears that mutations in the receptor occur at some locations that are involved in the association with GH, so that these mutations can lead to a GH-GH receptor interaction that is subnormal. Also, there appears to be a lower concentration of GH-binding proteins in the sera of children with idiopathic short stature, suggesting that mutations of the receptor and decreased expression may explain the poorer utilization of GH in these children. FIGURE 5-24 Structure of the GH receptor-GH complex. The structure of human GH and serum GH-binding protein was derived from crystallographic coordinates. 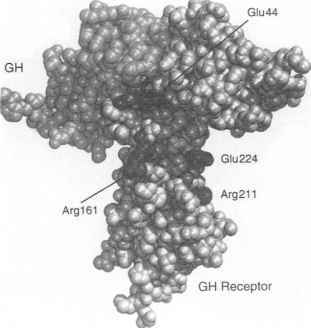 The GH receptor residue Glu44 interacts with Arg64 on the GH molecule. Reproduced with permission from Goddard, A. D., Covello, R., Luoh, S.-M., Clackson, T., Attie, K. M„ Gesundheit, N„ Rundle, A. C„ Wells, J. A., and Carlsson, L. M. S. (1995). Mutations of the growth hormone receptor in children with idiopathic short stature. New Engl. J. Med. 333, 1093-1098.
growth, but this is a very costly treatment. 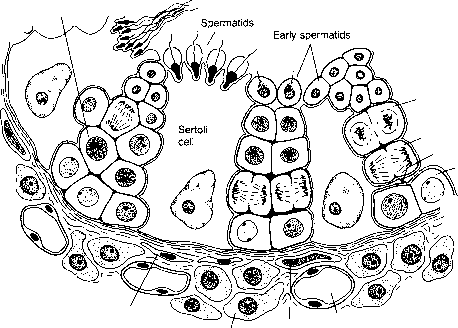 Work has shown, by use of somatic cell hybridization and following the course of human genomic segregation, that the genes for GH, chorionic somatomammotropin (hCS), also known as placental lactogen, have been localized to chromosome 17 in humans. The GH receptor (GHR) is a member of the hemato-poietin receptor gene family already described. The GHR gene is located on chromosome 5 and has 10 exons over a distance of 87 kb. As shown in Figure 5-25, exon 2 encodes the signal peptide, exons 3-7 the extracellular domain, exon 8 the transmembrane domain, and exons 9 and 10 the intracellular domain. Exon 1A has a TATA box at -31, a CCAAT box at —88, and sites for the binding of several transcription factors involved in liver-specific gene expression, including the glucocorticoid receptor and C/EBP-like proteins. The single gene GHR gives rise to several transcription products, including a 4.2-4.7-kb mRNA encoding the full-length receptor, and a 1.0-1.4-kb transcript encodes a truncated receptor in rat and mouse, but not in humans, rabbits, or pigs. A 2.1-2.6-kb transcript appears in rat liver and adipose. The GHR protein is composed of 638 amino acids, with an extracellular domain of 247 amino acids and a 24-amino acid transmembrane domain. The extracellular domain is extensively glycosylated. Several molecular weight forms of GHR have been observed for complexes with GH ranging from 122,000 to 300,000 for different species. The receptor is probably 100,000 bound with one 22,000 GH molecule. Higher molecular weight forms may involve disulfide bonds between 100,000 subunits. Some GHR in the human is cova-lently linked to ubiquitin. Like the PRL receptor, GHR is in the transducing active form as a homodimer. Thus, GH is released from the pituitary in homodimer form joined by one Zn2+ atom. The dimer dissociates in response to bloodstream dilution into the monomeric form and binds to hGHR. The membrane-bound hGH then complexes with a second hGHR to form the receptor homodimer, which initiates signal transduction. For one molecule of GH to bind two molecules of GHR, GH must possess two interactive domains in its structure. These are suggested in Figure 5-26. These two different sites on GH interact with identical sites on both GHRs.